An expert explains the evolution of Navajo weaving from the 17th to the 19th century and uncovers the distinctive characteristics of the three phases of Navajo Chief's Blankets. 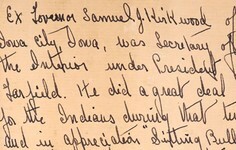 At the Tucson ANTIQUES ROADSHOW in summer 2006, appraiser Douglas Deihl, of Skinner in Boston, Massachusetts, examined an antique Navajo blanket, probably woven in the 1870s, that was colored with indigo blues and a variety of reds. "Stylistically," Douglas told the woman who owned the blanket, "this is called a Navajo third-phase chief's blanket." In the middle of the 17th century, the Navajo had begun sheep herding and making their own wool, skills they picked up from the Spanish settlers. By the late 17th century, they learned to weave from their neighbors, the Pueblo. The weaving skills of the Navajo craftswomen surpassed those of the Spanish and the Pueblo craftsmen within just a few decades, and Navajo blankets became a prized possession desired by the wealthier Indians and Spanish throughout the West. "These were worn by the Navajos," Campbell says, "but they were also commercial items that were traded to the Sioux, the Cheyenne, and the Ute." They were prized, in part, because they served as coats by day and blankets by night and were far lighter than buffalo skins. The Navajo wove the blankets so tightly that they were "practically waterproof," notes Campbell. The blankets were also valued for their beauty, and an important Indian would wear a blanket proudly as a ceremonial wrap at special occasions. They were commonly called "chief's blankets" by Indians and traders — and are still referred to by that name — because they were so expensive that only chiefs or other wealthy individuals could afford them. 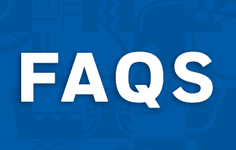 To put it in perspective, Campbell says that in 1860, to buy such a blanket cost between $100 and $150. "Guys are making $5 a week if they're lucky, about half that if they're blue collar," Campbell says. "So that's a year's wages for most men. You could buy a house for $200." 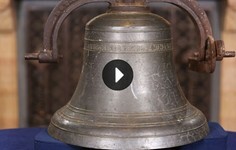 This first-phase chief's blanket from the Tucson ANTIQUES ROADSHOW in 2002 was valued at between $350,000 and $500,000. 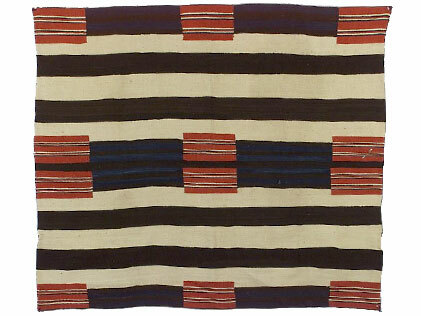 Until about the 1820s, the Navajo made simple striped blankets identical to the Pueblo. Then Navajo weavers began making what cultural historians call the "first-phase chief's blankets." 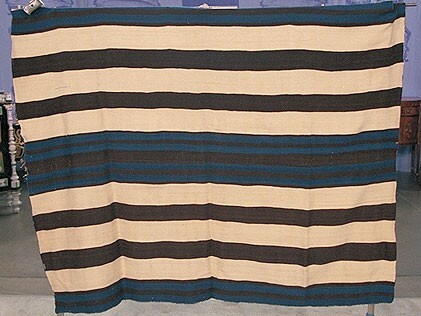 The design for these is the simplest of all the Navajo 19th-century blankets, consisting of brown, blue, and white bands and stripes. These blankets, which the Ute Indians prized (hence the reference to them as Ute-style) are most valued by Navajo blanket collectors today, in large part because of their rarity. Less than 50 of these first-phase blankets, made until roughly 1865, survive. 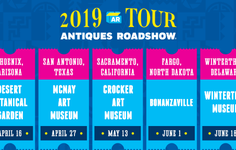 In 2002, an unsuspecting owner of a first-phase Navajo blanket found out at the Tucson ANTIQUES ROADSHOW that his blanket was worth between $350,000 and $500,000. 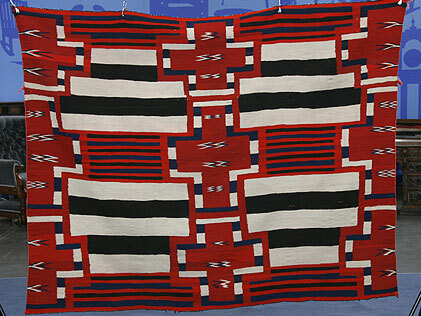 In about 1850, Navajo weavers began adding red rectangles to their blanket designs, which cultural historians use as a marker for "second-phase chief's blankets," which were made until about 1880. "They always have 12 rectangles, grouped in twos," Campbell says. "In the third phase, they went to nine diamonds and half-diamonds." As these design elements were added, they grew larger, becoming more centerpieces of the blankets than embellishments. 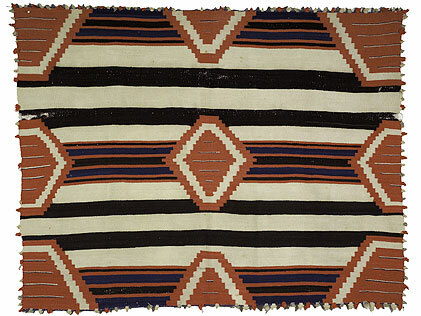 During the third phase, Navajo weavers also added elements inside the diamonds, including, Campbell says, "zigzags, crosses, thin lines, stacked elements, and triangles." At the beginning of the second phase, the weavers had also started expanding their color palette, adding yellow and green accents, for example. But one of the colors the Navajo weavers coveted most was the red from the prized bayeta cloth made in England and later, in Spain and Mexico. They would unravel the cloths and then weave the material into rectangles on their blankets. The bayeta, occasionally used in first-phase blankets, became a color and cloth that Navajo weavers used prominently in the second phase. The bayeta was dyed with cochineal, named after the cochineal beetle. "It came in rich shades from rose to deep burgundy and it's permanent," Campbell says. "There's no plant in the Southwest that will give you such an intense red that won't fade." These three phases composed what is called the Classical period of Navajo blankets, which ended with the arrival of the railroad to the Southwest after 1880. "Cheap manufactured blankets arrived," Tyrone says. "If a Navajo blanket cost $100, one made by Pendleton" — a mill in Pendleton, Oregon, that manufactured blankets for Indians — "cost you $3. The market was killed," Campbell added. "In order to cater to the ever-greater number of tourists, the Navajo began making rugs." Walk in Beauty: The Navajo and Their Blankets, by Anthony Beriant and Mary Kahlenberg. Gibbs Smith, 1991. 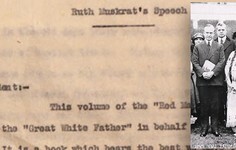 Navajo Textiles: The William Randolph Hearst Collection, by Nancy Blomberg. University of Arizona Press, 1994. Southwest Textiles, by Kathleen Whitaker. University of Washington Press, 2002. This 19th-century blanket is woven in a variant second-phase pattern using the prized red bayeta cloth. The red rectangles in this blanket are often used by experts to identify them as second phase. 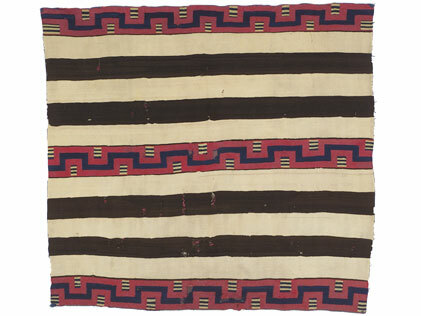 This Navajo wearing blanket from the 19th century is in a third-phase pattern with its nine diamonds and half-diamonds. This third-phase chief's blanket would be worth more if an analysis were to find that the red dye is natural cochineal as opposed to synthetic.